Ranging from white glistening beaches to pictorial backwaters and from ancient forts to modern tourist villages, Thiruvananthapuram is replete with various interesting options for amusement and thrill. The Happy Land Water Theme Park is one of these ideal destinations in Thiruvananthapuram, which has everything for the visitors here of every group. It is one of the best places in the city to relax and have fun with family and kids, this amusement park featuring everything required for a nice outing or picnic with friends and family. The water rides here appeal to the young and the old alike. 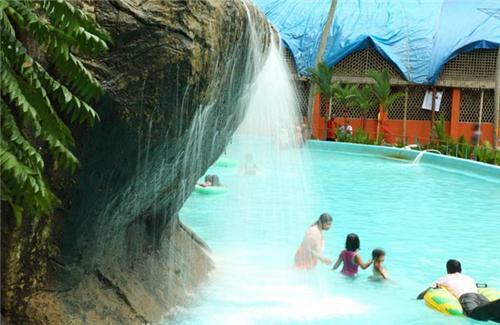 In fact, the fascinating natural setting as well as the exciting and entertaining rides make Happy Land Water Theme Park one of the most desired locations to visit in Thiruvananthapuram offering the unique option for prior online booking. The spacious water theme park on a sprawling stretch of vibrant greeneries with sloping hills at the background make the nature setting around a very charming one adding to the attractive layout of the entire facility. Situated within easy reach of the main city area, the Happy Land Water Theme Park is positioned nearby the fringes of the town in the locality called Vembayam. Thrilling water rides, onsite water theme restaurant, separate Kids Village and decorated art gallery, Happy Land Water Theme Park includes everything required for an exciting day-out amidst pleasure and fun. Cleanliness of the entire facility pertains to the regular health checkups and hygienic cleaning that is an intrinsic part of the everyday activities carried out at the facility under the strict supervision of the management team. The onsite art gallery at Happy Land Water Theme Park exhibits the rare paintings of famous artists, paintings being available for the visitors to be purchased also. Retail stores are located within the premises of the theme park where visitors can choose and buy from a wide range of souvenirs, which comprise of cups, hats, t-shirts and various other interesting articles. The Kid’s Village with its various interesting rides is great fun especially for the little ones. The Shoe Slide, Ball Pool, Butterfly roundabout, Flower Basket, and several other amusing water-rides appeal to families from near and far making it an ideal picnic spot in Thiruvananthapuram. 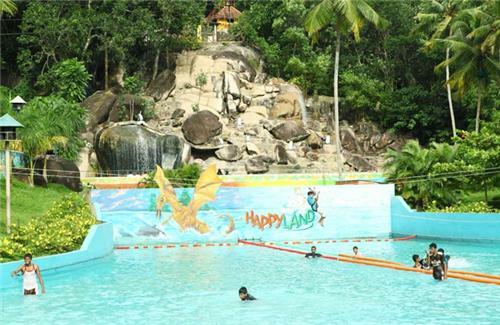 The fun-filled rides at Happy Land Water Theme Park are the major attractions here, the perfect option for a relaxing outing. Following the marine theme, the sea created at the park is named Wave Pool, which is a great place to enjoy swimming and other interesting activities, the ambience offering here the real feel of plunging into the splurging sea water. The genuine experience of exploring a waterfall is obtainable at the Rocky Falls, the place being a place to have real fun in the fresh and cool waters. The Family Pool is designed and created for every member of a family, something or the other being present here for each one in the family – various types of interesting water rides. Aqua Trail is a unique and fun-filled water ride at the Family Pool, which gives all the members of the family the opportunity for enjoying together. Uphill Water Ride is one of the most entertaining arrays of rides, which feature various types of amusing rides, each being different from the other. Happy Land Water Theme Park is the best place in Thiruvananthapuram to enjoy family get-togethers and organize formal events, the facility having all the essential features to host any event, whatever may be the occasion or the size of the gathering. The events ideal to be organized at Happy Land Water Theme Park include product launching, wedding anniversary, birthday party, corporate meeting and stage performance.